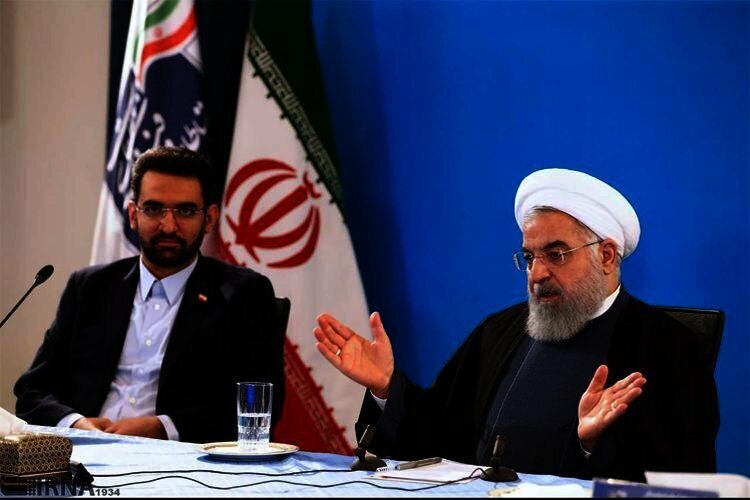 The president of the Islamic Republic of Iran Hassan Rouhani criticized the lack of free press and the state’s control over the media in a Monday meeting with senior heads of the Ministry of Information and Communications Technology. Iran’s president acknowledged that the state controlled Iran’s media and blamed the social media “inflation” on the lack of free press in Iran. “The reason is that we don’t have free press. We have government run press, government run TV and radio. If we had 500 media sources, there would not be such an inflation in social media platforms,” he said adding that inflation was not only in economics but was also relevant on social media. “(The people) express everything (on social media) because they have nowhere else to talk. If the various factions had a TV station, they would express half of their statements there. They would talk officially not unofficially and it would be clear who is saying what. But now (on social media) it’s not clear who these people are and where they came from,” Rouhani said. He cited the good and bad effects of technology and said that the benefits of technology outweighed the bad. “We cannot separate the lives of people from technological and communicational development,” Rouhani said. He noted that the regime’s filtering policies had failed to curb Iranians use of social media platforms stressing that the government had reached the conclusion that filtering was not the “solution” to “misusing” the internet. According to him, “educational” methods had to be implemented to prevent the misuse of the internet and social media platforms in Iran. Rouhani failed to mention which institution ordered the filtering of social media platforms and stood behind the arrest of internet activists and social media channel administrators in Iran. Before this, the Assembly of Experts discussed the use of social media platforms in a January 17 meeting with the participation of Iran’s Minister of Information and Communications Technology. “A number of the gentlemen remarked at the meeting that Americans held the key to social media platforms and that these platforms were under the authority of the US,” Ahmad Khatami the spokesperson and senior member of the Assembly said. “Therefore the dangers of social media are not limited to the Islamic Republic’s religion and state, but it actually harms the country’s independence as well,” he added in remarks carried by the IRNA news agency. “The question is not whether to not use social medial platforms. This would be like when the radio first came, some said not to use it despite the fact that this was impossible and one has to use new spaces and facilities,” the senior cleric who is also Tehran’s substitute Friday prayer leader said. “The important issue is that we should not let them overthrow the state before we use social media platforms and relevant officials have to use their authority to counter this trend,” Khatami added. Almost 50% of the top 500 visited websites worldwide are blocked in Iran, including YouTube, Facebook, Twitter, Google Plus and Telegram. In early January, an Iranian judicial official announced that Iran was also ready to filter Instagram, Facebook’s photo and video-sharing social networking service. The head of the Virtual Space Department of Iran’s Attorney General’s Office said that a court order had been issued to filter Instagram and that most members of the Supreme Council of Virtual Space, charged with overseeing Iran’s internet, agreed with the filter.